More than 121 people die by suicide each day. 1 donation can help reduce that rate. Hope For The Day strives to reduce suicide rates through education, outreach, and action. On Tuesday November 27th, we are launching our first ever Giving Tuesday campaign. On this 1 day of giving all funds raised will go directly to sustaining and enhancing HFTD’s free education programming. Educating our communities on mental health is crucial so that we can eliminate the highest risk factors of suicide, such as stigma and the lack of resources. In our free proactive prevention workshops we confront the leading obstacles of stigma and empower individuals with tools and strategies to enable proactive and effective mental healthcare for themselves and their peers. 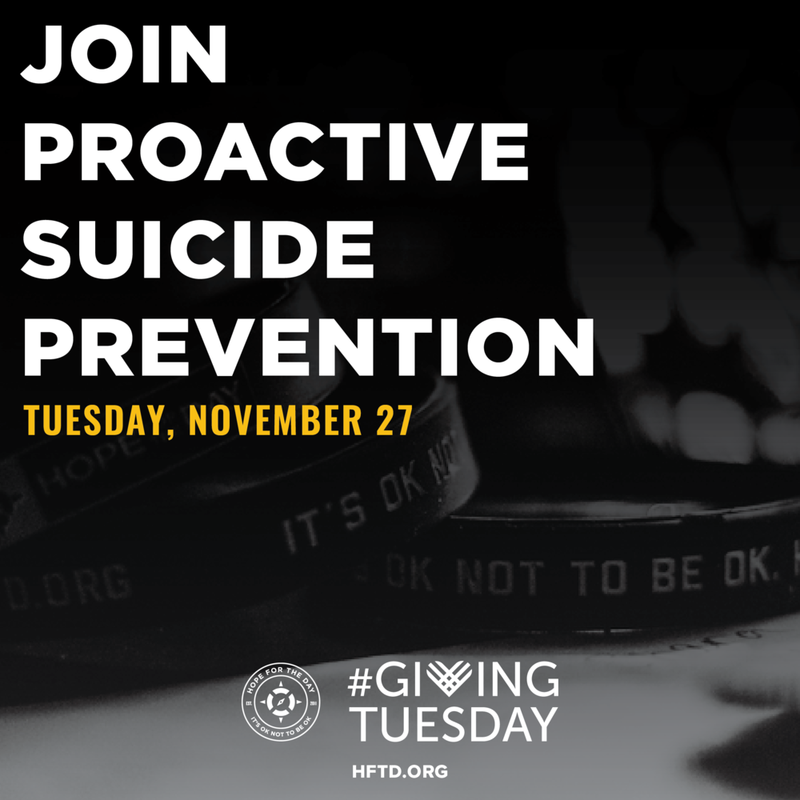 This Giving Tuesday, help us teach our communities how to prevent suicide. It costs $400 to fund a proactive prevention workshop for 30 students. Each student costs $13.33. Donate $13 to educate 1 person at a HFTD proactive prevention workshop. It only takes 1 person to educate themselves and raise their voice to impact thousands. Your donation will amplify the voices of those impacted by mental health, and will sustain HFTD’s education programming through 2019. #ItOnlyTakesOne. We Are In This Together. How many people will YOU choose to educate on proactive suicide prevention?